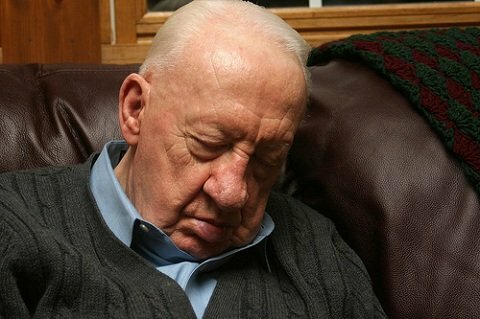 A bad sleep may be an early sign of Alzheimer’s if a study in mice also applies to people, say researchers. Clumps of protein, called plaques, in the brain are thought to be a key component of the illness. A study, published in the journal Science Translational Medicine, showed that when plaques first developed, the mice started having disrupted sleep. The hunt for early hints that someone is developing Alzheimer’s is thought to be crucial for treating the disease. People do not show problems with their memory or clarity of thought until very late on in the disease. At this point, parts of the brain will have been destroyed, meaning treatment will be very difficult or maybe even impossible. It is why researchers want to start early, years before the first symptoms. One large area of research is in plaques of beta amyloid which form on the brain. Levels of the beta amyloid protein naturally rise and fall over 24 hours in both mice and people. However, the protein forms permanent plaques in Alzheimer’s disease. Experiments at Washington University showed that nocturnal mice slept for 40 minutes during every hour of daylight. However, as soon brain plaques started to form the mice were sleeping for only 30 minutes. However, findings in mice do not always apply to people are there are many reasons for disrupted sleep.